Amorcare Mobility Stores Limited Amorcare is owned by husband and wife, Andrew and Nicola Morgan. Since trading commenced in July 2009, under their ownership, Amorcare Mobility Stores Limited (Amorcare) has gone from strength to strength. Sales have increased month on month and a first class reputation for service, quality and fairness in trading has been established with existing and new customers alike. The concept of Amorcare Mobility Stores Limited was built from the knowledge that the market has a place for a company that offered mobility products and supplies with a high level of customer support and care. Following 18 months of extensive research into the provision of independent living products, the owners found that after sales care was severely lacking and hence decided to set up the business firmly based upon a service level that people could truly rely upon, even the company name was derived from this caring approach – 'Amor' means love and 'care', well, means care! Amorcare takes its corporate social responsibilities seriously and is a supporter of the regional Air Ambulance and Macmillan Breast Cancer charities whilst regularly donating prizes at local fundraisers. 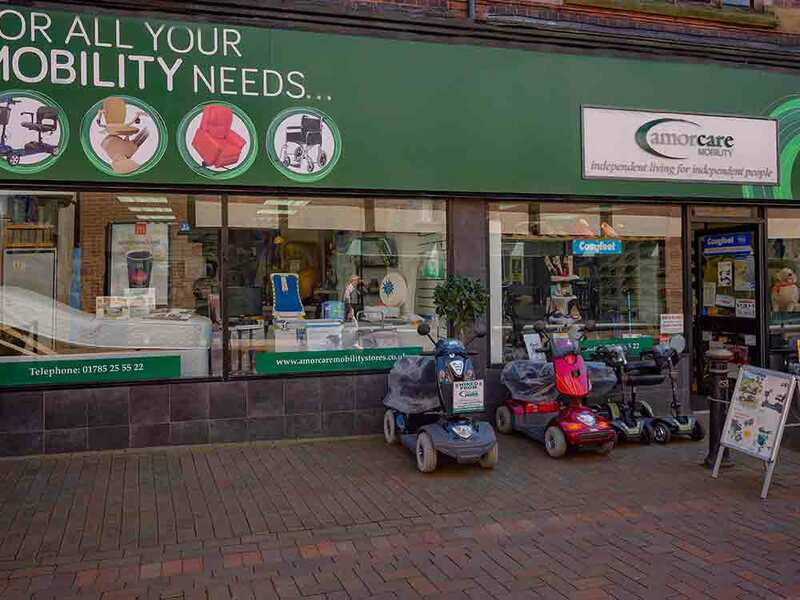 The owner's energy and unique skills, both within the area of supplying the mobility sector and Staffordshire have meant that this company has gone from strength to strength Amorcare Mobility Stores Limited have proven that it is perfectly placed to supply this market. Amorcare Mobility Stock a wide selection of products in store from, Mobility Scooters & accessories, Manual and Powered wheelchairs, Electric Dual Motor Rise Recliner Chairs, fireside chairs, Daily Living aids, Bathroom & Toileting Aids, Cosyfeet Footwear plus much more.. Amorcare can also organise the fitting of Straight & Curved Stair lifts. From our Stafford Store Amorcare Mobility offer a Mobility Scooter, Wheelchair hire service. It’s £5 to join the membership for one year and once joined customers can hire the equipment on an hourly basis for £1 per hour to assist them around the town whilst shopping, or if required can hire for longer periods such as going away on holiday, or days out. All members are fully insured to use the equipment so giving piece of mind. As well as our retail sales we also offer Mobility and wheelchair Servicing and repairs by fully trained engineers, including free collection and delivery to your door. Tel No - 01782 635064.